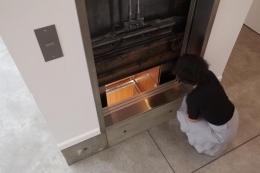 Sean Kelly Gallery is delighted to announce its forthcoming exhibition, Two Different Tomorrows, a major new sculptural installation by Leandro Erlich. The opening will take place on Friday, September 9th, from 6pm until 8pm. The artist will be present. The title of the exhibition grew from a conversation with the gallery in which the Argentine-born Erlich, while traveling in Asia, became confused about the “tomorrow” in his time zone and the “tomorrow” in the gallery’s time zone. Ironically, this sense of shifting realities is among the artist's central preoccupations. 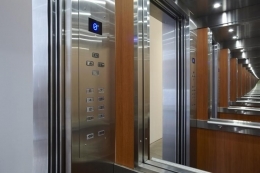 Two Different Tomorrows, Erlich’s most ambitious exhibition to date, will include four new sculptures that center on the elevator. 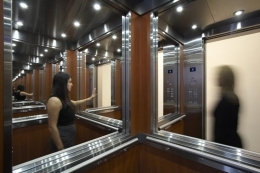 Stripped of their function and context, these elevators highlight the narrative potential of the ordinary. As viewers inhabit and observe the installations, they create their own stories, finding answers to Erlich's visual questions. 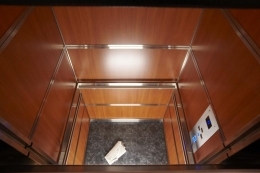 Elevators are, in Erlich's words, “a functional object, but one in which life seems to be suspended parenthetically. Recorded voices and music may intervene to ease the discomfort of the ride, but we cannot avoid ourselves in such a space and so experience the Sartrean room of the self. We are no one, nowhere, anyone, anyplace." 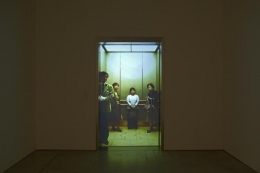 Confounding logic and defying the laws of physics, Two Different Tomorrows presents us with multiple scenes: a maze of elevator banks becomes a tunnel of reflection; an elevator stuck between floors invokes an impossible space; and a working elevator door provides a portal to another world, opening and closing to reveal people filmed in an actual elevator in Tokyo. The largest of the works is a 50-foot long elevator shaft turned on its horizontal axis. 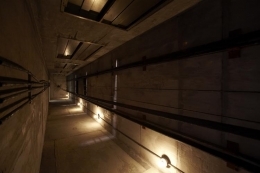 Instead of plunging down the elevator shaft, viewers will walk down the “side” of the interior wall towards the elevator car. 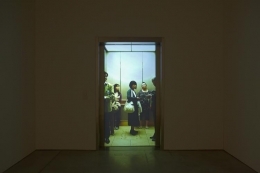 As viewers pass horizontally through a vertical passageway, they will find themselves deposited into the main gallery, unsure of which end is up. An architect of the uncertain, Erlich creates spaces with fluid and unstable boundaries. Before we even try to make sense of the image, we sense the uncanny. A single change (up is down, inside is out) can be enough to upset the seemingly normal situation, collapsing and exposing our reality as counterfeit. Through this transgression of limits, the artist undermines certain absolutes and the institutions that reinforce them. Between 1998 and 1999, Erlich took part in the Core Program, an artist residency at the MFA in Houston, and came to the attention of the art world at a young age. In 2001 he was invited to represent his country in the 49th Venice Biennale. He then participated in the Biennials of Istanbul (2001), Shanghai (2002) and São Paulo (2004). 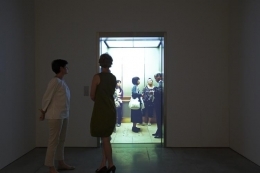 He has also participated in the Whitney Biennial (2000) and the 1st Busan Biennale, Korea (2002). 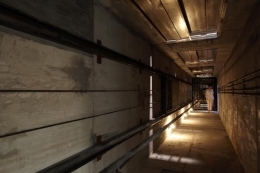 He was part of La Nuit Blanche de Paris (2004), the 51st Venice Biennale (2005), the Echigo-Tsumari Art Triennial, Japan (2006), and the exhibition Notre histoire at the Palais de Tokyo, Paris, in 2006, among others. 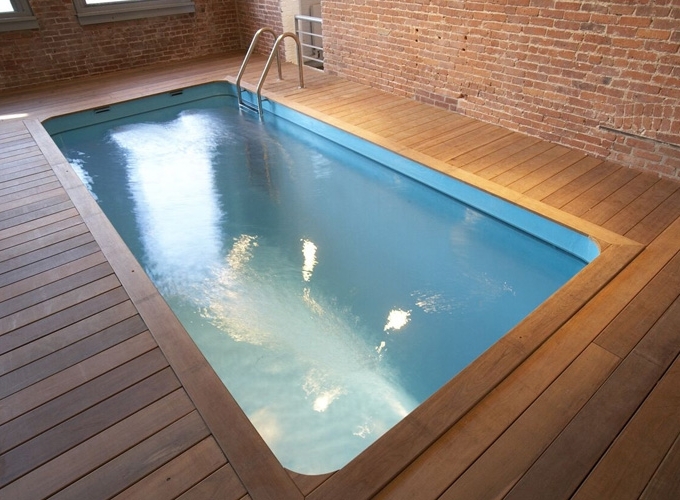 In 2008, his installation La Torre was exhibited at Museo Reina Sofia, Madrid, and he showed his acclaimed Swimming Pool at MoMA P.S. 1 the same year. Currently his work can be seen in the Paris-Delhi-Bombay exhibition at the Centre Pompidou in Paris through September 19, 2011. Erlich's works are included in several private and public collections including the Museum of Modern Art, Buenos Aires; The Museum of Fine Arts, Houston; Tate Modern, London; Musée d'Art Moderne, Paris; 21st Century Museum of Contemporary Art, Kanazawa, Japan; MACRO, Rome; The Israel Museum, Jerusalem; and the Fonds National d'Art Contemporain (FNAC), Paris.